You will find no shortage of fine Palanga restaurants, with a number of them lining up Basanavicius Street leading to the beach. If you are having a relaxing beach day and looking for a quick café lunch, some pizza places by the pier and outdoor cafes serving very descent food are always an option. Otherwise, for more atmosphere just stroll along the main streets and you will surely find something for your liking. In summer time a lot of restaurants offer live entertainment. When I am on holiday I look for restaurants that offer something extra, like pleasant ambiance, history and great service and of course, the quality of the food. It makes the whole dining experience more special and adds to the fond memories of the holiday. 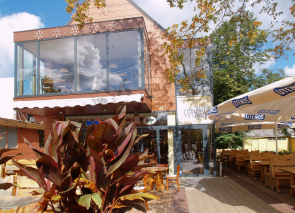 We decided to feature a few Palanga restaurants that we enjoyed the most, leaving a number of others for you to explore and choose your own favourite. At the moment DeCuba is our absolutely favourite restaurant in Palanga. 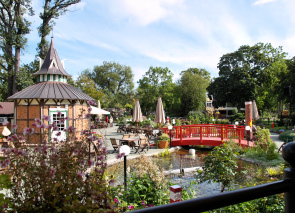 Head to their back garden and you will enter an exotic oasis of blooming flowers, cute lanterns, miniature ponds and tamed wild birds. 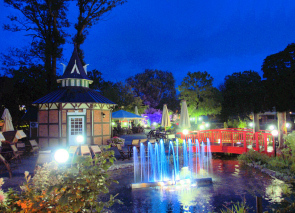 We had meals there on several occasions, it’s pretty in the daytime, but at night it’s really fantastic with its illuminated glowing garden, music and playing fountains. 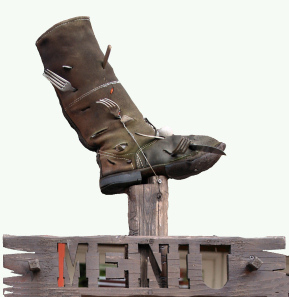 The choice of international cuisine is great, sizes are big and professionally cooked food comes very well presented. tel. +370 656 83 222. 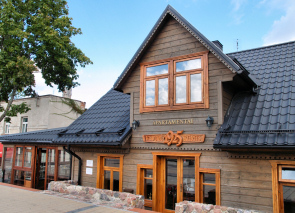 Set in what we consider the most charming wooden house in Palanga, this café-restaurant–bar is one of the first choices for a tasty meal and relaxing atmosphere. A tasteful deco inside carries the character of the past with photos of old Lithuania on the walls and cosy fireplace. If you choose to sit in their very cute back yard you will be sheltered from the noise of the street and surrounded by flower pots and old time artefacts. There is also a special playground for kids. Centrally located on Basanavicius Street. A friend recommended us this restaurant for its big sized freshly caught fish dishes. Even though we didn’t find it one of the most exciting restaurants in Palanga, we still found a pleasant ambiance and good quality food. 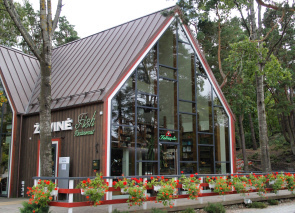 The restaurant's large windows look out onto a surrounding pine forest, they also have seating on a big terrace that stretches out to the calming and refreshing forest. The deco inside is simple, bright and elegant with white table cloths and library –like surroundings. Convenient location-on the way to the central beach. This is a fantastic place to taste some authentic Armenian cuisine and wine. They offer to try some beautifully grilled meat alongside other Armenian meals. They also have vegetarian entrees. Fresh vegetables spiced and grilled on open fire–was my favourite. You can’t help coming here again for a very enjoyable experience surrounded by a cosy Armenian inspired interior with ornate rugs and cushions. 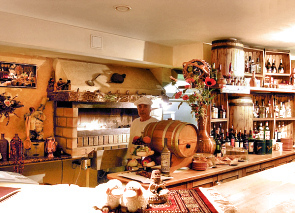 Cagino Restaurant is well worth trying out for its delicious Russian cuisine. This restaurant in Palanga is just as good as the outlet in Vilnius, which we have described on the Vilnius restaurants page. The restaurant interior is bright and cheerful and the varied menu offers tasty and filling dishes And good value for money.